Result has introduced new padded soft shell garments to its range for 2018. The new R237 X Black Compass Padded Softshell Jacket and R238X Black Compass Padded Softshell Gilet feature a microfleece inner which offers extra warmth with no extra weight. Featuring on-trend chevron padding with contrast printable softshell sleeves and trim for a stylish look, the jacket and gilet are showerproof and windproof. This makes the garments very suitable for the autumn/winter season. 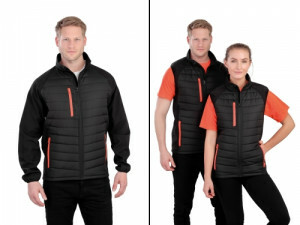 Both garments feature printable soft shell sleeves and have a full front zip with chin guard, stand-up padded collar, soft bound cuff or armhole and a padded body. Other additional features include contrast pocket and front colour zips, and a neutral black zip pull. The tagless and ready to brand R237X Black Compass Padded Softshell Jacket and R238X Black Compass Padded Softshell Gilet can be decorated by print and embroidery. The unisex garments are available in sizes XS-3XL and in colour combinations of Black/Red, Black/Orange, Black/Royal, Black/Lime and Black/Grey.